Anyone who owned a pet would know that the biggest worry you have is when you leave your pets at home on vacation is how to feed them. 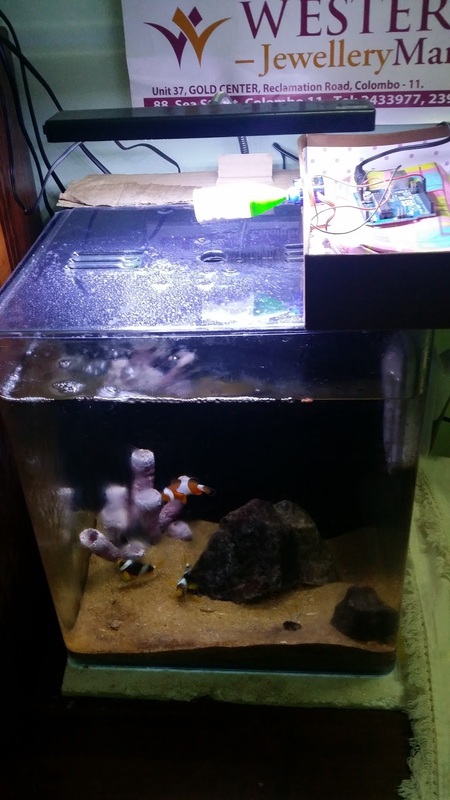 I am a novice Marine fish keeper with a 32 Litre Nano Saltwater Fish Only Aquarium. The livestock is not much but I have 2 Clarks Clownfish (Amphiprion clarkii) which are common in Sri Lankan waters, 1 Ocellaris clownfish (Amphiprion ocellaris) which is actually not so common in Sri Lankan waters but imported from Pacific Oceanic waters specifically Indonesia and 1 Sand Gobi which usually stays under the rock. Sri Lanka has strict policies on handling Live Rock and Corals in order to protect our shores, so it is almost impossible to find a legal pet store having those. Importing also strictly controlled. Anyway I wanted a way to feed the fish while I was away on Vacation for 2 days and 1 night. So with this intention I put up a quick hack fish feeder within couple of hours which actually managed to do the job and keep my fish fed and alive. I had to come up with this because Automatic Fish Feeders are also not so common in Sri Lanka and one have to import it from online shops if they really want one. I had some servos and an Arduino UNO Rev 3 hanging around and managed to put a small step up where Arduino pin 9 is connected to Servo's actuating pin and 5v to power pin and ground pin to ground. With this small setup I took the Example for Servo Sweep and Managed to modify it so that the Servo does 180 Degrees rotation 5 times every 6 hours. I took a candy container, cut it to make it shorter and put some holes near the bottom with a hot nail. Then went in the fish food. Finally I used to box lid to hold the servo in place and managed to secure it with rubber bands, powered the Arduino using a 12v power adaptor and voila! I have a Quick hack fish feeder.